A long weekend usually means less news, but for those looking for a new and quite often attractive take on news, the ongoing battle for geek chick supremacy offers a bountiful choice. Michael discribed Morgan Webb’s daily tech show as “a winner” and even stays up till 2am to catch new episodes. Occasional mens mag model Morgan Webb delivers tech related news from across the world. Our August 2007 review here. The favorite podcast of the occasionally drunk, and mostly single team at CrunchGear, Cali Lewis delivers a daily dose of tech news, with a stronger focus on gadgets and geeky stories. Not content with simply taking on Google, Jason Calacanis hired Veronica Belmont for a daily show about pretty much anything and everything. Pure, blissful, fluff. 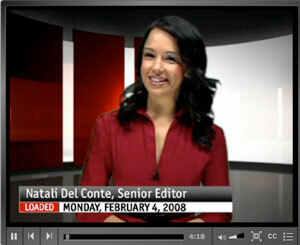 Former TechCrunch writer Natali Del Conti talks tech news for CNet. Strangely CNet doesnt support embedding so you’ll need to click here to view the show. See our February 2007 review here. New York’s Sarah Meyers interviews interesting people and provides commentary on society as a whole.